Some blog readers might recall that I live on a family compound. It’s not my family compound, not technically. But by virtue of growing up in this small town and six degrees of AYUH, I feel like I’m part of the family. I’m not sure of the exact acreage and the total count of Mason brothers, brides, cousins, and chickens, but it’s a peaceful compound out here in the country, with a steady rhythm of activity. Family coming and going, lots of hard work getting done daily. Lately, though, there’s been more than the usual amount of coming and going. From sun up to sun down, it’s been non-stop buzzing and whirring. Lawnmowers parade across the sloping yard, trucks come and go, and heavy equipment I can’t identify goes chugga chugga chuggas around the driveway. I may even have heard the sound of gun shots. Maybe it was just an old truck backfiring. When the sun goes down, the pond comes alive with an obnoxious group of bull frogs. One night, I had to go over to the window and yell “SHUT UP!” Good thing it wasn’t the night a roving gang of young people were torching marshmallows on sticks in the fire pit. And drinking Moxie. Yep, it’s that time of year. The Moxie Festival is less than a month away and my friend and neighbor, Gina Mason, is in charge of the parade. Plus, both her son and her cousin are running for re-election; did I tell you Gina likes politics just a little bit? The compound is being Moxified because this year is…ELECTION YEAR MOXIE! Wait…I almost forgot to remember that Gina’s husband Rick is entering a vehicle in the Moxie Car Show this year, too. I’ll keep the details of his vintage treasure for a future blog post. I hear the sounds of birds chirping, the sky outside is brightening. 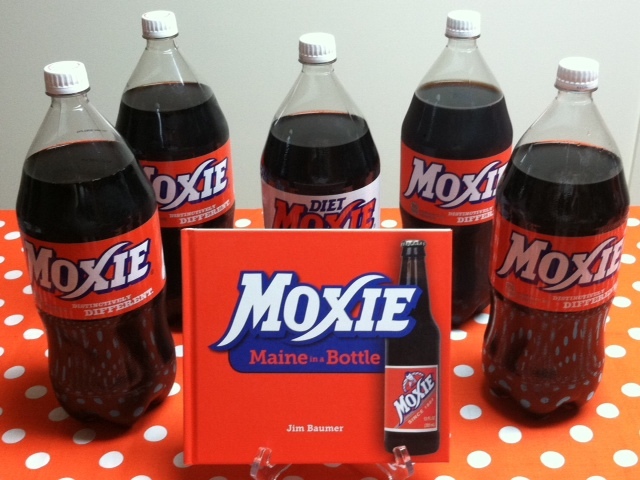 It’s time to get my Moxie on. I’m escaping the compound today, running off to Scarborough to share the distinctively different goodness of Moxie with visitors at the inaugural “Sip and See” Kitchen Tour. The last of the three-part “Divine Series” of home tours, the proceeds for this event benefit The Center for Grieving Children. This entry was posted in Talk of The Toile, You've Got Moxie! and tagged Dale Crafts, family compounds, Garrett Mason, Gina Mason, Lana Wescott, Marcy Boynton, Rick Mason, Scarborough Sip and See, The Center for Grieving Children, The Divine Series. Bookmark the permalink. There did seem to be quite a bit of activity outside in the parking lot, last night. Enjoy today’s soiree in Scarborough. Fly that orange loud and proud–I know you’ll represent Lisbon Falls and Moxie very well.